There has been a 21 per cent reduction in violent Maoist incidents across the country this year compared to the corresponding period in 2016. NEW DELHI: There has been a 21 per cent reduction in violent Maoist incidents across the country this year compared to the corresponding period in 2016, it was announced at an high-level union Home Ministry meeting held here on Friday. 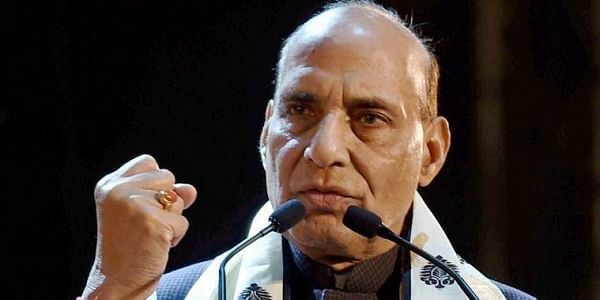 Union Home Minister Rajnath Singh, who chaired the high-level meeting, assured of providing all possible support to the Chhattisgarh government to deal with Maoists. "During the meeting, it was brought out that the declining trend of LWE (Left-Wing Extremism) violence continues across the country which has seen an overall reduction of 21 per cent in violence incidents over corresponding period of last year. The LWE continue to remain under pressure with ever shrinking influence, both in terms of geographical spread and public support," a Home Ministry statement said. Issues of security and development related measures were discussed in the meeting, the statement said, adding currently, the Centre is providing security related assistance to Chhattisgarh which includes provision of paramilitary forces, helicopters, Unmanned Aerial Vehicles and Counter Insurgency and Anti Terrorist Schools. "In addition, 11 India Reserve Battalions and two Special India Reserve Battalions have been sanctioned to the state. Funds have also been provided for fortification of 75 police stations and for capacity building of Special Forces under the Special Infrastructure Scheme. "As part of the multi-pronged strategy to deal with LWE, the central government gives equal focus to development measures to bring Maoist-affected districts at par with other areas. Towards this end, the central government has approved a Special Central Assistance Scheme for 35 worst affected LWE districts with an annual outlay of Rs 1,000 crore Important development schemes include the Road Requirement Plan (RRP) Phase-I under which Chhattisgarh was sanctioned 1988 km of road out of which 1351 km have been completed," it said. The statement said under the newly launched RRP-II, Chhattisgarh has been sanctioned a further 891 km of road. To improve mobile connectivity, 519 mobile towers have been installed in Phase-I and another 1,028 towers are being planned in Phase-II of the project, it said. "As part of efforts to enhance skill development, Chhattisgarh has been sanctioned nine ITIs and 14 Skill Development Centres. The initiatives taken to improve education infrastructure include approval of two Kendriya Vidyalayas at Bijapur and Sukma and three Jawahar Navodaya Vidyalayas at Bijapur, Narayanpur and Kondagaon. "Jagdalpur Medical College has been approved for up-gradation as Centre of Excellence at a cost of 200 crore under Pradhan Mantri Swasthya Suraksha Yojana. "The Jagdalpur airport has been included under the regional connectivity scheme and work for making it operational is nearing completion. Financial inclusion initiatives include sanction of 707 post offices and opening of 108 ATMs and 81 bank branches in LWE affected districts in last two years," it said. The meeting was attended by the Chhattisgarh Chief Minister Raman Singh, Union Minister of State for Home Hansraj Gangaram Ahir, Union Home Secretary Rajiv Gauba, Chhattisgarh Chief Secretary Vivek Dhand, Director General CRPF Rajiv Rai Bhatnagar and senior officers of the Home Ministry and the Chhattisgarh administration.